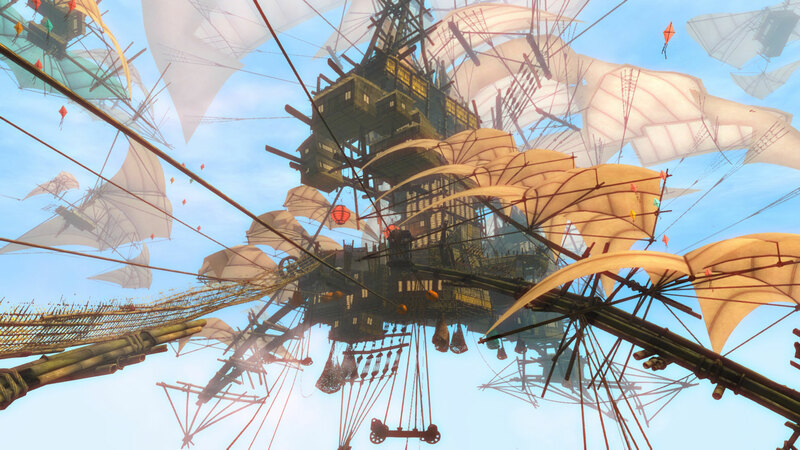 One of the biggest arguments that naysayers level against MMOs is that they're often just 'theme parks': digital Ouroboroses that mime dynamism but are, at the end of the day, mostly rote and repetition. It's something that ArenaNet seems acutely aware of. Though Guild Wars 2 is not completely innocent of the familiar MMO tropes, it looks like the developers have been trying to shake up all that staticity with stuff like the on-going Living Story. Is it working? Kinda sorta yeah. Some of the Living Story updates have been better than the others. Dragon pinatas? Hit or miss. Political assassinations and the chance to influence the structure of the game for years to come? Immensely and indubitably rad. The latest installment, the appropriately titled 'Cutthroat Politics', is probably the most promising one to date. But, is this the start of a beautiful thing or a flash in the pan? I wanted to know more. And so, I did what any self-respecting journalist would do. I tracked down Game Director Colin Johanson and made him answer a ton of questions, many of which were only tangentially related to my initial curiosity. It was a cold, foggy San Francisco afternoon when we finally had our Skype interview. Brief niceties were exchanged. We laughed about a kerfuffle with the conference equipment. After that, it was on to the hard-hitting questions. "So, what's the deal with chairs?" A brief, surprised laugh. "You know, I honestly have no idea. One of the great challenges that we faced with chairs, and this is kind of ironic, is that because we put in five different races of differing heights into the game, we found we had to make every chair uniform and have everyone always sit on them the exact same way or build an entire system that recognizes the height of the chair and appropriately animates your character." Being able to sit on chairs is a privilege, not a right. Johanson adds dolefully, "We kind of forced ourselves into a corner where we either go back and re-art every chair in the game, or we build this system for sitting. I think in the grand scheme of things, given all the other projects, we have going on, sitting, as important as it is, is not something we're currently working on." We continue. I ask Colin if the Living Story will propel the central narrative behind Tyria's struggles or if it is a vehicle for side stories and crustaceans with inappropriately shaped faces. Short answer: Yes. "The living world updates that we did in the first half of this year definitely fall under the category of side story arcs kinda." Johanson remarks. "However, I can say that the story that's playing out right now is a part of much larger story, and it's something that will become clear as the year progresses." He reassures me that there is a master plan in effect, that things are happening behind the proverbial curtain. That said, Johanson seems aware that it might seem otherwise to players. "Some of the bigger pieces of feedback that we've heard from our players is that the things that happen in the living world are very compartmentalized. They feel like they happen to a very specific part of the world, they feel like they're transient, that they occur and go away again and that's something we're working on." Johanson points to the latest release. For those who haven't been keeping up, here's the lowdown: an important political figure has been killed. Two candidates, both with very different agendas and personalities, are vying for the newly vacated spot. 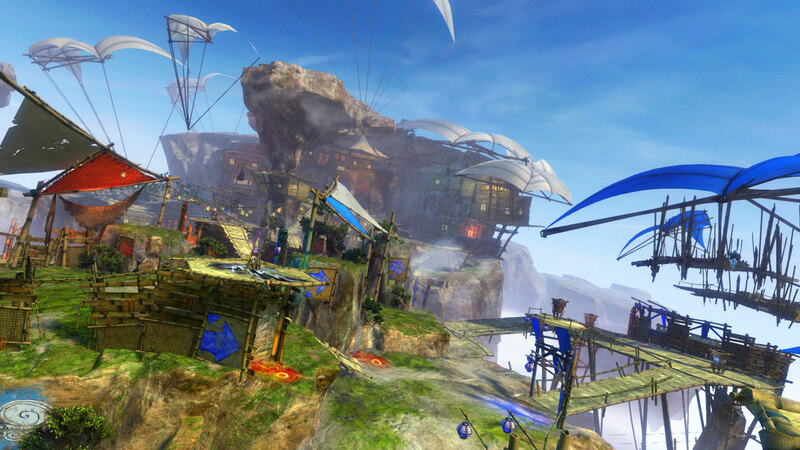 Players can decide who gets the position by participating in a series of events and games. It's not a terribly efficient voting mechanism, but it gets the job done. "You're voting to determine who this character will be that will be on the Lion's Arch council and the outcome of that vote will permanently put that character on the council where they will be deciding things about the future of the game constantly in the future. The council will vote on whether or not they'll be involved in wars, whether Lion's Arch is going to sign peace treaties or sign trade treaties. Whoever you vote in? They're going to be part of those decisions and these things can have ramifications for years to come and affect the entire game." I'm musing over his sly hints about the little changes that have been happening to the human capital Divinity's Reach when he says, "We'd like to do more and more of that." "So less Dragon Bash and more dragons, y'mean?" I ask. "Are we going to see more serious stories?" I can almost hear him nod into the microphone. "Yeah, I think we will. And maybe, maybe not just in tone but also in terms of scope, grandeur and what it really means for the world. I think we want to have our living world content feel like it really is a bigger part of a changing world." "Are we going to do those additional maps and new regions and expand our stories so you can go to those, and see more dragons? The answer is 'Absolutely, yes'. It's just a matter of 'Will those make sense, timeline-wise, with the other projects we're also building?'" Briefly, we mill around what Johanson and his team, economical usage of time aside, want for Tyria. It's the usual suspects: more dungeons, revamps of bosses, bigger and better things. I interrupt him, mid-way. What about Zhaitan? Something on their list. Johanson describes the visuals of the fight as 'incredibly impressive' and 'really awe-inspiring' but acknowledges that the experience could have been much better. "It really got finished right before the end and basically got put out of the door in time for us to ship." 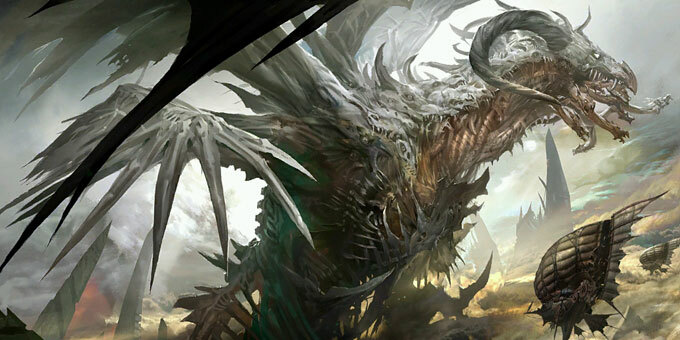 As for the other dungeons littering the world of Guild Wars 2, Johanson says that the teams do, in fact, plan to revisit 'about every dungeon that currently exists in the game and go through each one to try and make them more exciting, more fun, more compelling and also more rewarding'. "Great! But how? What would be changed?" Everything is fair game. "Some of the dungeons that we may not think are as exciting? We may just blow them up entirely and come up with something else from the ashes. New mechanics, new new bosses, new rewards. Polish-wise, some of our dungeons are much closer to where we'll like them to be and maybe, you'll see smaller changes and smaller upgrades." "How do you feel about the dungeons right now?" I ask slowly, glancing at the sprawling Reddit thread that came up earlier that day. "With the speed runs, the full berserker sets, people breaking the system and, well, y'know." "No matter what we do, there will always be a group of players who try to min-max any game that's ever made and they try to find the fastest, most rewarding way to play it with the best composition of skills and party members that they can possibly get to acquire the most rewards possible." The shrug is almost physical. "And I don't think you really can ever do anything to do that. It's just the inherent nature of certain players in the game." Instead of abolishing a demographic's favored play-style, Johanson is looking to provide alternatives. He says that what they want to do is incentivize and reward people for dealing with lot of different content. ("We're sort of developing a dungeon reward system right now that gives you an extra bonus at the end of each unique dungeon path you play.") "What we're really trying to do is embrace the fact that some people are going to do that and try to make it more fun for everyone in general." The conversation slips into the more philosophical. I field a question from Twitter, "Do you think that there's a future in the MMO archetype where the player is always the hero?" 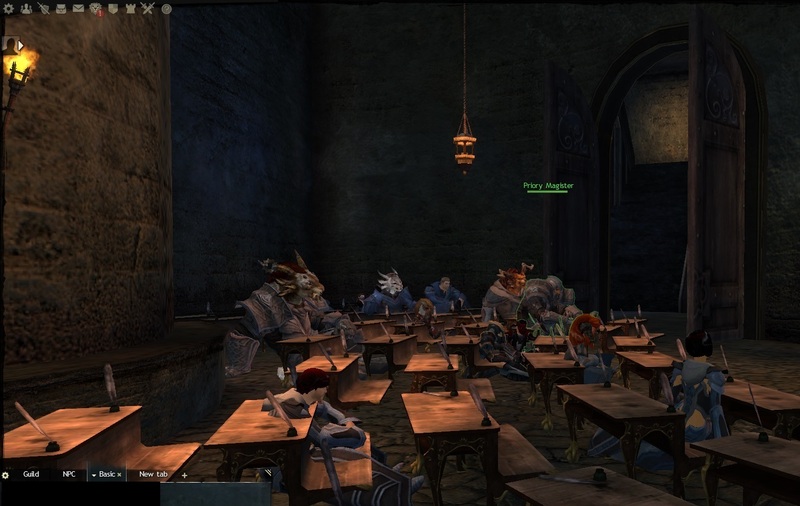 "I think one of the greatest things about MMOs is that they hit such a wide range and variety of player types." Johanson begins, and I can almost hear the first notes of some inspirational song swelling up behind him. "I think the key, as an MMO developer, is to constantly be thinking about who is the target audience - very often, you have multiple simultaneous target audiences - for your game and provide them with as much of a rich experience as you can. "There are a lot of players who want to feel like the hero. They want to feel like they're the ones who saved the day. And that's one of the hardest things to do in a game where you're running around with a million other players at the same time." Hence, the Personal Story which, Johanson says, didn't quite work out the way they had wanted. "I think, in particular, there's moments in the end of your personal story, where it starts feeling like it isn't about your character, that it's about someone else and you just happen to be tagging along." Such grandiose moments are not the only ones on Johanson's radar. As evidenced by the recent Cutthroat Politics, there are also stories for those more interested in being a part of their world rather than the singular champion. In regards to whether the content that players invest in will gain more permanence, it looks like the answer, yet again, is a 'yes'. "Earlier this year, we had a big focus on events that were not permanent. Things happened and then they weren't available because that part of the story was completed." Circumstances are evolving, though. "The maps are changing permanently as a result of this content that is currently going on. There is now, and certainly will be a lot larger focus on ensuring that the content we're building is creating experiences that people can permanently have when they come back two years later. Instead of saying, 'I see something that happened two years ago but I can't experience it,', we want players to say, 'I'm playing this and I'm playing it as a result of something that happened two years ago.'" One of the biggest things about the latest patch is that, depending on the candidate who wins the votes, a different dungeon will be installed in the game. 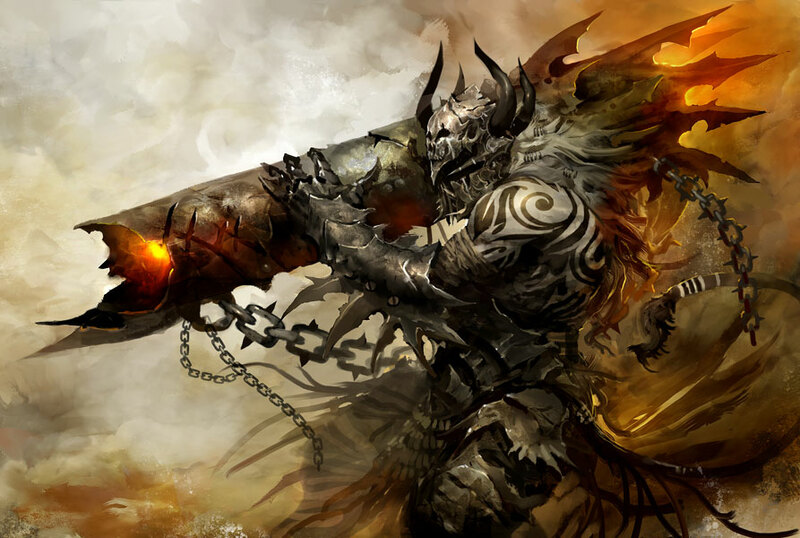 Should Gnashblade ascend onto the council, Guild Wars 2 will then be able to witness the Fall of Abaddon. But, if Ellen Kiel makes the cut, the game will bear witness to the mysteries of the Thaumanova Reactor which, unlike Abaddon, is almost completely alien to the lore. "Well, I can say that the reactor was the first prototype of the Inquest attempt to build something. Somewhat similar to what players find in the Crucible of Eternity later in the game. And the location where the Thaumanova Reactor was at one point in time exploded and destroyed what was once a research lab and turned, I would say, turned the world inside out where it occurred. I can't give away too much more than that. I would say that if people want to know more, they should vote for Ellen and find out. Either way, it's definitely something that ties more deeply into the lore of Guild Wars 2 than most would realize - "
Again, we switch gears. The clock continues ticking down. Johanson tells me that the art team is in the process of creating a bazaar's worth of new clothing and armors. Unfortunately, most of these new threads won't be custom-fitted to include horns, it would seem. Is more race-specific gear on the agenda? "I can't really say for sure. We're focused on stuff that is less race specific because it has a broader appeal and gets us more coverage for the work time we put in." "Of all the things we build, armors and giant bosses take up the most time. Anything we make that is one race specific, we are putting in a lot of work that we could be expanding out to all the races. I'm not going to say that we're never going to do more race-specific armors, but those are definitely going to be less common than the normal, one-size-fits-all armors." Impressive as they might be, Charr armors takes time to build. "Does that mean more than trench coats and cowboy hats for the medium armor wearers?" "I'm sure we will expand beyond just that." The last ten minutes are a shotgun flurry of questions. "One last question. Will we see more recurring villains?" "One last last question. Where the heck did the Consortium go during the recent Bazaar?" "They're in the background licking their wounds right now. I think they're trying to figure out how to deal with the trade situations that are going on, the stuff that happened at Southsun and holding together their trade agreements. I will say that they're keeping a very careful, watchful eye on Evon Gnashblade and his Black Lion Trading Company." A beat. Johanson continues, smoothly. "I will say also that I think there's an interesting question to ask. The fractals, for the most part, were opened based on research funded and driven by the Consortium. And the portal to the Fractors? Right next to a Consortium trading post. Both Evon and Ellen are running on platforms of driving change within the Fractals and investigating moments that happen in time. So, I think, as a player, it makes me ask the interesting question of, 'what's going on there?' and 'What are the Lion's Arch Council and candidates up to against the Consortium?'" Instead of attempting to wheedle a more concrete answer, I fire the last query on my list, feeling a little guilty: "Last last last question. I swear. Guild features aren't currently a priority, it has been said. Can you comment on that?" "I would say that guild features in general are all really important to us. But people who can work on those features are the same people who are involved in a couple other very specific projects and so we only have a few of 'em who really can work on the player and guild account databases. We're waiting for them to finish other stuff before we can do a lot of guild-related projects. So we do have a few things in the pipeline already for guilds that are coming. As I've outlined in my blog post last week, I think that there's a lot of the high level stuff that we need to finish to get the core of the game where we really want it to be. When that's done, I think we'll turn our eye to sort of the next round of features and a lot of those certainly are guild related things among, you know, other types of content and expanding out experiences for players and looking beyond the regions we have." There's a long, pointed pause. "No. That really was the last question. Thanks!" 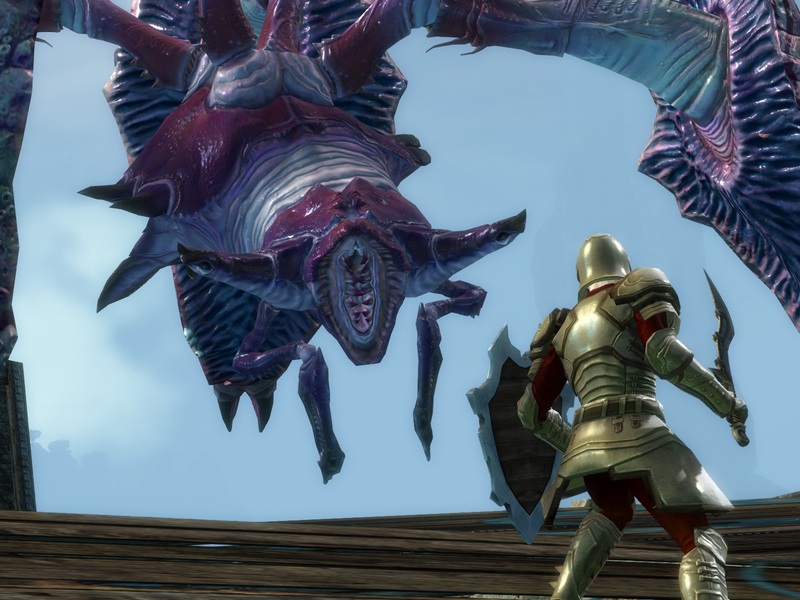 Tagged with ArenaNet,	demo,	Guild Wars 2,	ign,	Interviews,	ios,	MMOs,	twitter.